Position rack in bottom third of oven; preheat to 375°F. Grease 9-inch pie plate. Roll out dough on floured surface to 13-inch round. Transfer to prepared dish. Fold edges under and crimp, forming high border. Line crust with foil; fill with dried beans or pie weights. Bake 15 minutes. Remove foil and beans. Bake until edges are light golden, pressing crust with back of fork if bubbles form, about 7 minutes. Cool 10 minutes. Reduce oven temperature to 350°F. Reposition oven rack to center. Mix pumpkin with the next six ingredients. Add eggs one at a time, making sure each is thoroughly incorporated after each addition. Gradually add coconut cream, processing just until blended. Process 5 seconds longer. Pour filling into warm crust. Bake for 30 minutes, or until edges are set-ish. 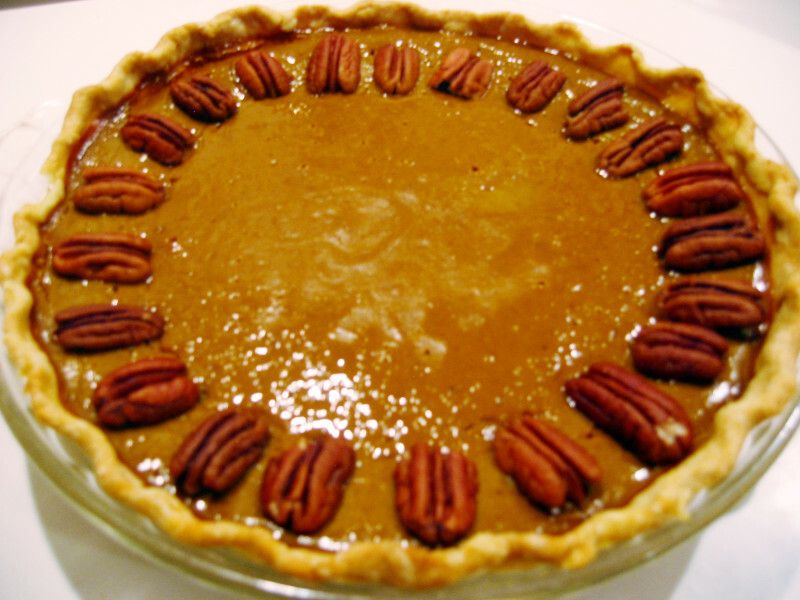 Place pecans around edge and return to baking, until edges are puffed and center is set, about 1 hour. Cool completely on rack.